Cisco Application-Centric Infrastructure (ACI) reduces TCO, automates IT tasks, and accelerates data center application deployments. It accomplishes this using a business-relevant SDN policy model across networks, servers, storage, security, and services. 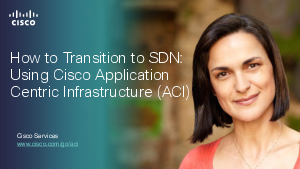 Download this paper to discover how ACI will benefit your business.